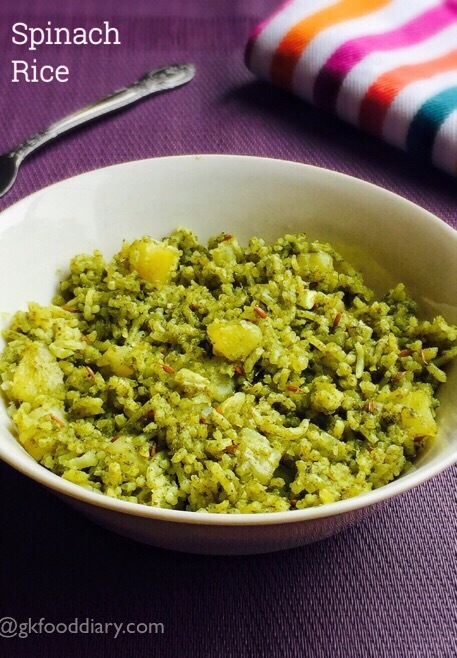 Spinach rice – an one pot meal made with rice, spinach and vegetables. I always try different lunch recipes with spinach and this was one such try. 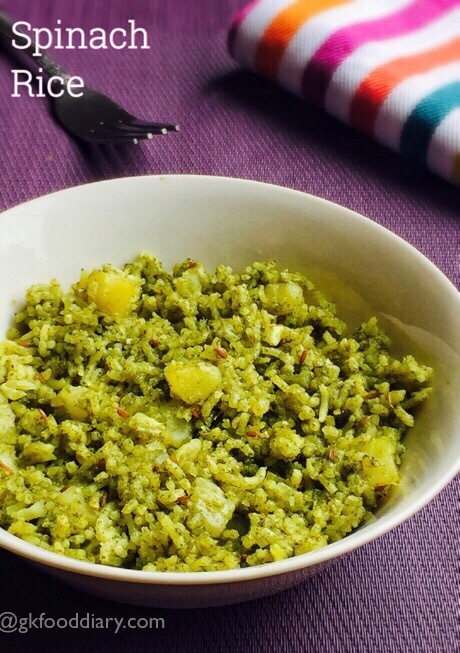 It tastes so good and the little one at the home had it without any complaints:) This spinach rice can be tried with any spinach variety , it is very easy to make for lunch and packing lunchboxes. It can be given to kids from one year and its one of the best ways to make the pick eaters to eat greens. Check more rice varieties for kids lunch box here. Now lets get on to check how to make spinach rice recipe for toddlers and kids. Wash the rice twice and soak it in for 20 minutes. Chop, garlic, onion and potato into bite size pieces. Set aside. Clean and wash the spinach thoroughly. Grind the spinach, Coriander leaves, mint leaves, green chilies to a smooth puree without adding any water. Keep it ready. Heat a pressure cooker with ghee and add bay leaves, cinnamon, cloves, cardamom & cumin seeds. 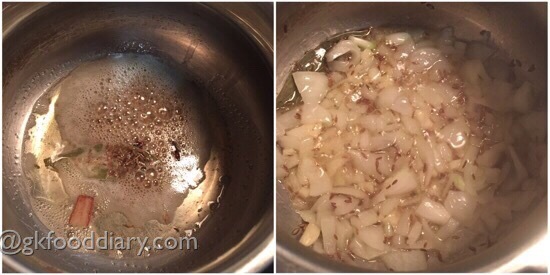 Once cumin seeds Starts spluttering, add onions along with chopped garlic. Saute them nicely until golden brown. 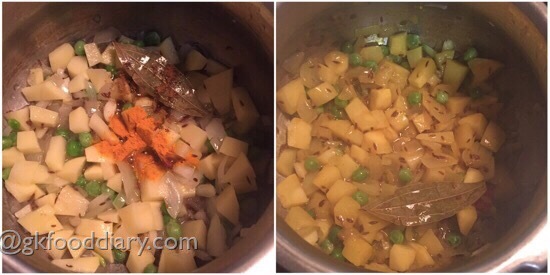 Once the onions becomes brown, add the chopped potato pieces, green peas, turmeric powder, garam masala powder along with salt. Fry it for a minute. Now add the ground greens paste. 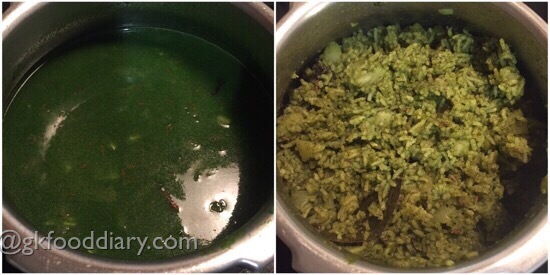 Fry the paste until the raw smell leaves.Then add the soaked rice to the spinach gravy and mix well. Add water and bring it to a boil. Then close the lid of pressure cooker and cook everything in a medium flame for two whistles. Once the pressure releases, open the cooker and fluff the rice with a spoon slowly. Now add lemon juice, mix well and top with ghee if required. 1. Wash the rice twice and soak it in for 20 minutes. Chop, garlic, onion and potato into bite size pieces. Set aside. 2. Clean and wash the spinach thoroughly. 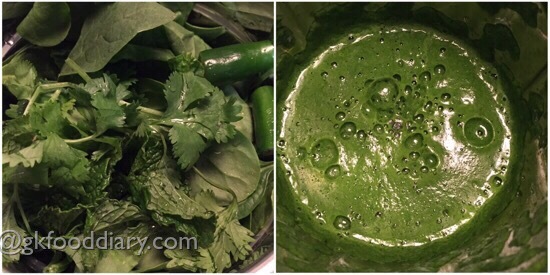 Grind the spinach, Coriander leaves, mint leaves, green chilies to a smooth puree without adding any water. Keep it ready. 1. Heat a pressure cooker with ghee and add bay leaves, cinnamon, cloves, cardamom & cumin seeds. Once cumin seeds Starts spluttering, add onions along with chopped garlic. Saute them nicely until golden brown. 2. 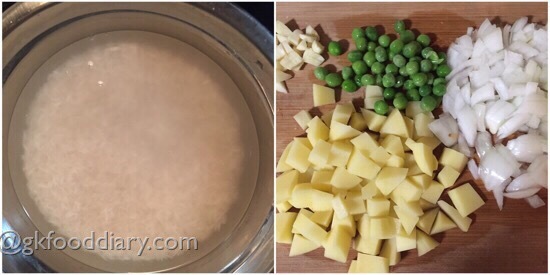 Once the onions becomes brown, add the chopped potato pieces, green peas, turmeric powder, garam masala powder along with salt. Fry it for a minute. 3. Now add the ground greens paste. Fry the paste until the raw smell leaves.Then add the soaked rice to the spinach gravy and mix well. 4. Add water and bring it to a boil. Then close the lid of pressure cooker and cook everything in a medium flame for two whistles. Once the pressure releases, open the cooker and fluff the rice with a spoon slowly. Now add lemon juice, mix well and top with ghee if required. 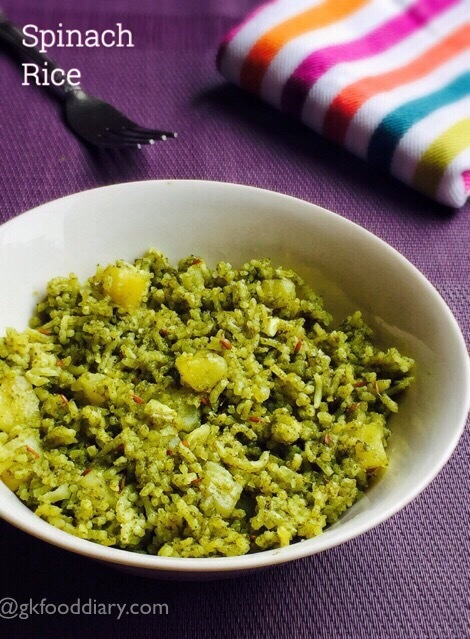 Serve the spinach rice with onion raita or plain curd/yogurt! Dont skip the lemon as Vitamin C in the lemon helps to absorb iron in spinach. Make sure to Wash and clean the spinach leaves thoroughly to get rid of mud if any. 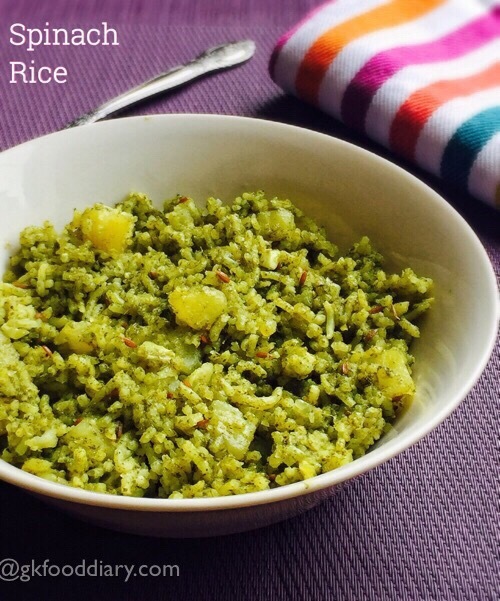 You could use any rice variety to make this spinach rice. Adjust water quantity accordingly. 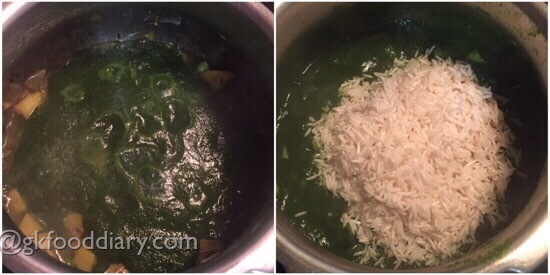 Water amount mentioned in the recipe was good enough to cook the rice as spinach leaves leave out water while cooking.